Non studded 36x48 with a 20x12 lip chairmat for hard floors provide both comfort and floor protection. This hard floor chairmat facilitates chair movement and protect the underlying floor with our high quality vinyl chairmat. These 36x48 w/20x12 lip hard floor chair mats for wood, tile and concrete floors allow your desk chair to roll easily while Working at your desk. 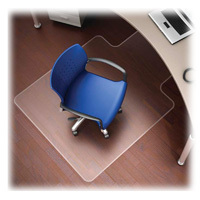 Large non studded chair mats increase range and ease of motion while seated and support your back.